In a Facebook status on July 27, China posted,"Hindi po ako ang Nasa scandal Okey?? Tgnan ng Mabuti at alamin po.."
In a telephone interview by DJ Mo, Mikey Bustos and Sam Oh on Monday, July 28, 2014, China denied the allegation and said: "I feel really bad". 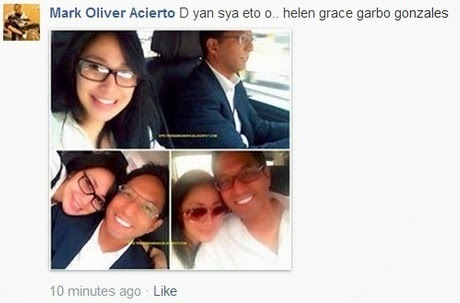 China Roces' Facebook account has received a lot of hits after she was linked to the scandalous video. Another name that was dragged into the controversial issue is Helen Grace Garbo Gonzalez but she also nullified the allegation.